*This car is for sale as a Classic Showcase restoration, equal to our driver/show-driver/show restoration levels. Please see our restoration page for further information. This highly original numbers-matching XK-140 SE was built in June of 1956, and delivered new to Louis R. Emme at the US Embassy in Oslo, Norway. Known by the current owner for more than a decade, the XK-140 SE has been kept in storage for many years, and is in very appealing and honest condition maintaining a high degree of originality throughout. The coupe is straight and free of any major corrosion issues. The vehicle will need servicing to make it road ready. With it's highly stylish design and Special Equipment package, this fixed head coupe stands as a highly desirable and original model that is a great candidate for restoration! 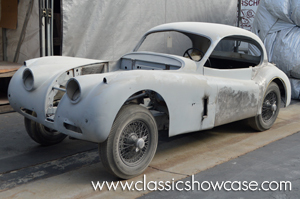 Newly introduced for 1955, the Jaguar XK140 was broadly similar to, though more refined than, its sensational XK120 predecessor, major engineering changes being confined to the repositioning of the engine 3" further forward and the adoption of rack-and-pinion steering. Outwardly the newcomer was distinguishable by its revised radiator grille, rear lights incorporating flashing indicators and larger bumpers, the latter adopted to withstand the cut and thrust of urban parking. Special Equipment (SE) cars came with wire wheels and Lucas fog lamps, and could be ordered with the C-type cylinder head for 20 more horsepower. XK140 performance was well up to the standards set by its exemplary predecessor, contemporary road-tests regularly recording top speed figures in excess of 120mph.